These pipes are pitched at 440hz, rich sounding and 100% genuine bagpipe sounds. Once loaded into your Digital Chanter will appear in the menu as Instrument ‘Usr’. To load the Key of C Scottish Smallpipes the Blair Digital Bagpipes app is required. Click Mac or Windows for your PC. Key of C Scottish Smallpipes for your Blair Digital Chanter. * Make sure your Blair Digital Chanter is registered. 3. 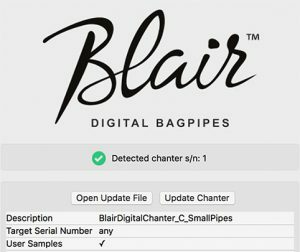 Open the Blair Digital Chanter app on your PC. 4. Connect the chanter to your PC via USB and in the Advanced menu on the chanter select ‘Software update’. 5. Your chanter’s serial number will appear on the PC app.